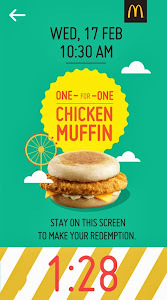 McDonald’s National Breakfast Day 2014 – the world’s biggest breakfast programme is back with a free Egg McMuffin giveaway and McDonald’s Singapore is aiming to set a national record! 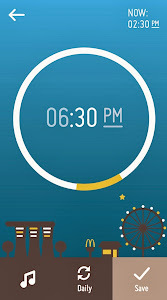 In addition, a breakfast application will be launched and “All Day Breakfast” will be served for the first time. 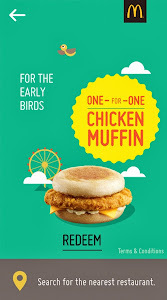 McDonald’s “National Breakfast Day” is a regional breakfast initiative across Asia, Middle East and Africa where participating restaurants will each give away 1,000 free Egg McMuffins during breakfast hours on a first-come, first-served basis. 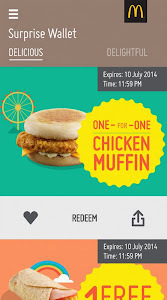 McDonald’s Singapore will be giving away a total of approximately 120,000 Egg McMuffins (for free!!) on Monday, 17 March 2014 (one day only) in its second year of “National Breakfast Day”, with the hope of setting a national record for the “Largest Number of Muffins Given Away”. 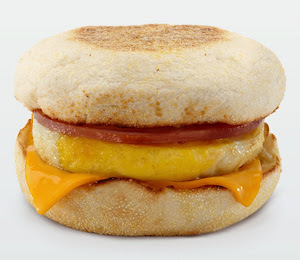 – Free Egg McMuffin giveaway will be available from 6am to 11am, while stocks last. For Compass Point and Clifford Centre branches, this will be from 7am to 11am. – Redemption is based on presentation of valid original coupon. The coupon will only be handed out at the stores on 17 March 2014. Only one redemption per coupon per customer is allowed. – All except the following stores in Singapore are involved in National Breakfast Day: KKH Hospital, Yew Tee (including Yew Tee Kiosk), Tampines Interchange Kiosk, Lucky Chinatown, Clementi Avenue 3, Changi Airport T2 Transit and Science Centre Singapore. This year, in an effort to get even more customers energised about breakfast, “All Day Breakfast” will offered for the first time and this will be served in 124 restaurants across Singapore from 6am to 6pm on 17 March. 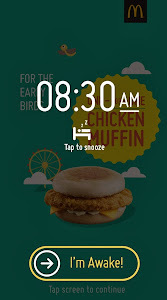 McDonald’s Singapore is also looking forward to creating even more breakfast excitement by providing people with fresh surprises they can wake up to every morning with their new McDonald’s Surprise Alarm app. – The full regular lunch/dinner menu is only available after 6pm. – Customers can still order some of their all-time favourites such as French Fries, McSpicy, McNuggets, McChicken, McWings, Nacho Cheese/Tangy Filet-O-Fish, Apple Slices and desserts before 6pm. Beef and McGrill burgers will not be available until after 6pm. – All except the following stores in Singapore are involved in “All Day Breakfast”: Yew Tee (including Yew Tee Kiosk), Tampines Interchange Kiosk and Science Centre Singapore. – All-Day Breakfast will be available until 7pm at Clifford Centre. 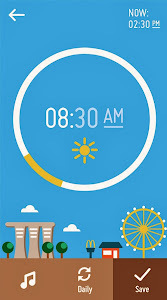 The theme of this app is for users to “Wake Up Happy” as you may wake up to find that you’ve won a prize! First you will need to download the app onto your mobile device from the Apple App Store or Google Play (available for download from 17 March, with surprises to be won from 18 March), check both boxes and tap ‘Begin’. 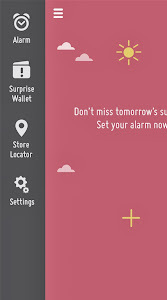 Access the alarm, surprise wallet, store locator, and settings functions of the app by expanding the menu, sliding in from the left of the screen. To collapse the menu, slide it back to the right. 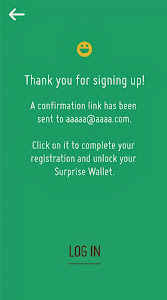 First time users will need to register via a Facebook account or a valid email address. 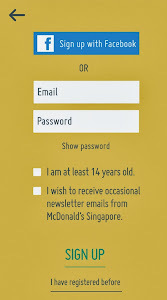 Do check your inbox for validation email from McDonald’s to complete your registration and unlock the surprise wallet. 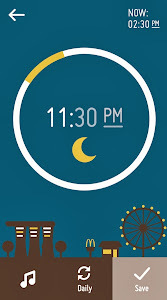 When setting an alarm, users can choose from a preferred alarm sound or “Surprise Me”. If the “Surprise Me” option is chosen, ringtones are randomised according to the surprise received. 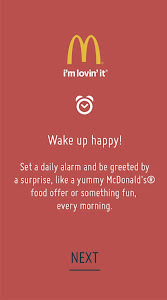 Multiple alarms can be set throughout the day, and once a day, you will receive a surprise from McDonald’s! How do you receive your surprise? When the alarm is turned off, a special McDonald’s surprise will be displayed. Surprises range from Food & Beverage Digital Coupons to music and video downloads. – All Food & Beverage Digital Coupons will have a stipulated expiry date (displayed on the top right of the coupon) and coupons will be stored into the app’s Surprise Wallet. – An internet connection is required to experience the app’s Surprise function as well as the randomised ringtone. – Users will only receive one surprise a day. • Before redeeming the surprise, first locate your nearest McDonald’s restaurant with the help of the Store Locator function. • To redeem the surprise, go to the Surprise Wallet to see all the coupons available and tap on “Redeem” to go to redemption screen. 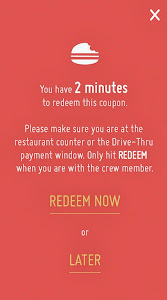 • Only when you are at the McDonald’s counter placing the order, tap the “Redeem Now” button and show the coupon to the restaurant crew. • The coupon will be registered as “redeemed” within two minutes of tapping the “Redeem Now” button. – Digital coupons are not available for use at iFly, Resort World Sentosa, and institutional stores. – Redemption may only be made in-store and at Drive-Thrus, and is not valid at McCafe, via McDelivery, and Dessert Kiosks. We were invited to dinner…err…breakfast…err…anyway, it was dinnertime but we were having McDonald’s breakfast for dinner! This was a hotcakes with sausage meal and it certainly was a preview of the all-day breakfast experience! A demonstration was then given by Mr Evan Kroft, on how the McDonald’s Surprise Alarm app works and it certainly sounds exciting! Can’t wait to download it!! The app took about 3 months to be completed and this will be launched on National Breakfast Day. There are plans to keep it in the long run for future promotions. Thanks to omy.sg and McDonald’s Singapore for the invite! 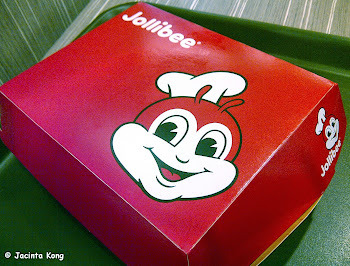 I had for a long time heard about this fast food chain from my Filipino colleagues and they raved about the fried chicken. 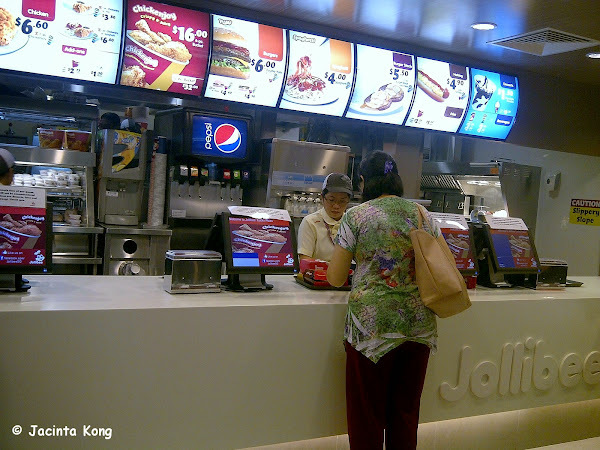 The first Jollibee outlet finally opened in Singapore on 12th March 2013 and there were unbelievably long queues which took at least 1-2 hours just to get into the outlet and order the food! Three months on and the queues are still there especially during lunch and dinner and worse on weekends. I had made 3 attempts to eat here since its opening but turned away each time I saw the crowd. Finally on this day as I had a medical appointment and was in the area, I decided to have a late lunch here to avoid the peak hour crowd. At 3pm on a weekday, the queue was only about 5-10min long and the tables were about 95% occupied. I ordered a 1 piece Chickenjoy with Spaghetti. The chicken was crispy on the outside and tender and moist on the inside. Although the seasoning used for the chicken tasted quite simple, the satisfaction to your tastebuds definitely surpasses that fried chicken fast food outlet with a 3-letter acronym! A cup of brown gravy was given as an accompaniment to the chicken and some people say that’s one of the highlights but I didn’t feel the same way as I found it to be salty. The spaghetti was covered with a sweet tomato-based sauce which had the consistency of ketchup, and topped with grated cheese. It sort of reminded me of home-cooking with instant pasta sauce. Overall the food was quite nice, considering that this is a fast food outlet. I will definitely patronise again provided that the queues are short (I mean how can you call it fast food if you need to queue hours for it, don’t you agree?!). I was invited to a food tasting session at Domino’s Pizza and at the same time learned a bit more about their services and operations. 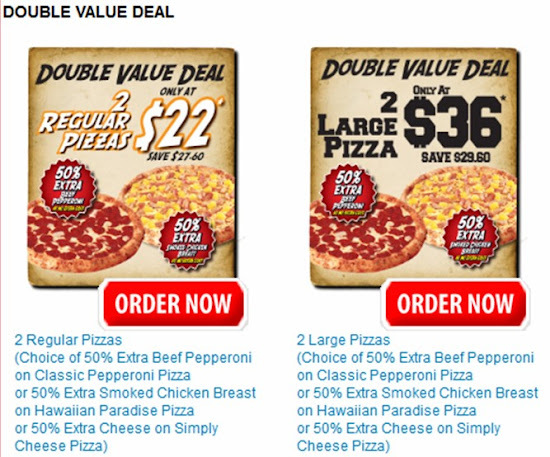 There is a Double Deal promotion which is available from 25th January to 3rd March 2013 and features two of their most popular pizzas – Classic Pepperoni (with 50% extra beef pepperoni slices added) and Hawaiian Paradise (with 50% extra smoked chicken breast added). Besides these two pizzas, cheese lovers can order the Simply Cheese pizza (with 50% extra cheese added) as part of this promotion. All the extra toppings mentioned are included at no extra cost. At first glance, I really didn’t know what to expect from this pizza but after I took my first bite, I fell in love with it! If you like cheese or dairy stuff you might enjoy this. It had a lovely creamy texture and was very fragrant. One for the vegetarians. A simple pizza with cheese and tomato paste and I thought the overall combination was quite nice. I like Hawaiian pizzas so was quite happy to see this! Hawaiian Paradise with Crunchy Thin Crust – I think I like this thin crust version better. I will definitely order this again. Classic Pepperoni – this is a meat lover’s delight and was one of my favourites! Add-ons like Garlic Cheese Onion Rings, Crazy Chicken Crunchies and Golden Roasted Drummets are delicious and make good complements to the pizza meal. When the meal was almost over, we were served with this little box which contained our dessert! Two types of dessert are available at Domino’s. The warm Chocolate Lava Cake is brimming with melted chocolate on the inside, which will ooze out when you cut into it. It was yummy but I personally felt it was a little too sweet and would have been perfect if it was topped with a scoop of vanilla ice-cream! The Caramel Sticky Dessert to my surprise wasn’t as sweet as the lava cake and I kind of enjoyed this although I’m not really a caramel lover. For pizza delivery in Singapore, you can call 62226333 or order online at http://www.dominos.com.sg. Delivery is free, prices are nett and there is a 30min delivery guarantee else you will be compensated with a free Regular Pizza voucher redeemable on your next purchase. Besides ordering online or by phone, Domino’s has an iPhone application which can be used to place your orders and the app also has a store locator feature which shows you where their outlets are if you decide to dine-in instead of having your pizza delivered. 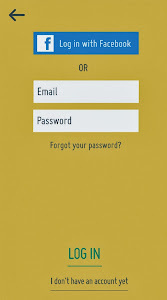 One thing to note is that you need to be a registered user. If you already have a login userid and password, the time taken to order a pizza can be as quick as 1 min 16 secs! Each person can register up to 3 phone numbers and 5 delivery addresses (these details can be added or deleted whenever you like). Did you know that you can order your pizza up to 7 days in advance? I love the fact that they provide this service as it is especially useful when you are planning for a party or perhaps want to order in during the festive seasons. One value-added feature which I like is that you can use the “GPS Tracker” (which stands for “Great Pizza Service Tracker”) to check the status of your order. Just access the iPhone app or go online (login required) and click on “GPS Tracker” to retrieve your order details – this will show you whether your pizza is being baked, packed or being delivered. Basically it tracks every stage that the pizza goes through before it arrives at your doorstep – it’s like you are “stalking” your pizza! 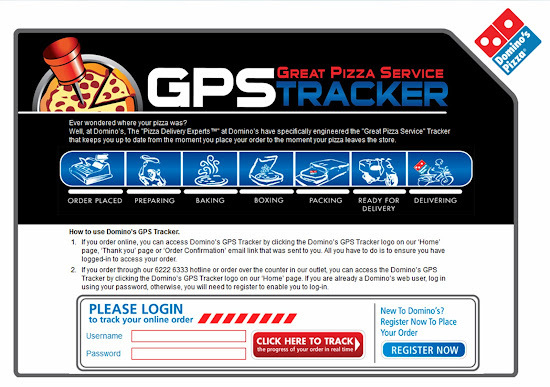 If the “DELIVERING” icon on the “GPS Tracker” is highlighted in red, you can standby at the door with your money as the pizza should be at your doorstep soon. In the event that you are busy and a friend or family member wants to check on the order status (i.e. the person checking isn’t the person who placed the order), they can do so by using the “GPS tracker” and keying in the phone number of the person who had placed the order. Basically their KPIs for the entire pizza delivery process are 12min in the kitchen and 15min for delivery. All pizzas are freshly made from scratch once the orders are received. Skillful pizza makers in the kitchen can make pizzas in 1-2min, then the pizzas are baked in the oven for 6min so the total time taken is about 9min. I went on a brief tour of the kitchen and found they have a humongous state-of-the-art oven which costs as much as a car! A grill with a conveyor belt type contraption will take the uncooked pizzas in at one end and output the cooked pizzas at the other end. Baking is a pre-programmed step which takes a fixed duration of 6min. The oven is set to bake at 470 degrees and takes 30-45min to warm up. Baking cannot commence until this temperature is met. They usually start pre-heating the oven at 9am so that the oven can reach the ideal temperature before it is opened for business at 10:30am. We weren’t allowed to take photos in the kitchen so I can’t show you any pictures of the oven. For those who prefer to walk-in and do takeaway, there is a TV screen in the store for customers to track the status of their orders. There is a 15min takeout guarantee and if this is not met, you will be given a free Personal Pizza voucher which is redeemable on your next purchase. Overall, I had a great time and was stuffed from all that pizza! Thanks to omy.sg for the invite and Domino’s Pizza for the food tasting!! 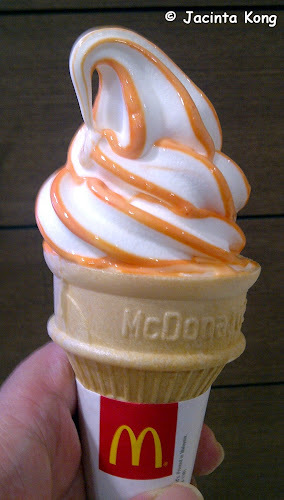 I guess since Chinese New Year is just around the corner, McDonald’s decided to sell this particular flavour in their Flavour Burst range of ice-creams. It’s been a while since I last ate one of these Flavour Bursts and I must say this Tropical Orange one is good! The taste kind of makes me reminiscent of my childhood days when I used to eat those orange-flavoured ice lollies, some of which had a milk filling inside. Someone else thought otherwise and said the orange in this Flavour Burst tastes like the orange-flavoured Skittles candy.